MIAMI - Video recorded in Downtown Miami on Monday showed a white man pulling a gun and shouting racial slurs at a group of black youths participating in a Martin Luther King Jr. Day protest. WPLG Local 10 reports that the Dream Defenders, a Florida civil rights group, was blocking traffic in Brickell to protest a development project in Liberty Square, a public housing complex. The demonstration was one of several Wheels Up, Guns Down events that take place every MLK Day across South Florida. A video recorded by a member of the Dream Defenders shows a woman get out of her car to confront the young demonstrators, several of whom are on bicycles. The woman and the protesters are seen shouting at each other. At one point, the woman accuses a boy of running over her foot and calls the group a "bunch of thugs." A man, later identified as Mark Allen Bartlett, 51, is then seen running up to join the confrontation. Bartlett pulls out a pistol as the woman directs him to the boy she accused of running over her foot. The armed man approaches the boy and orders him to "get out of here, you f***ing piece of s**t!" Bartlett is then heard calling the kids "f***ing stupid n****rs" and "f***ing dumb-a** f***ing n****rs" before returning to his vehicle. In a video recorded earlier, the woman is seen confronting the group, saying that she has kids she needs to pick up and that her car is being blocked by the protest. Police said the Dream Defenders called them to report the incident, and Bartlett was pulled over and arrested about 6:30 p.m. Monday. 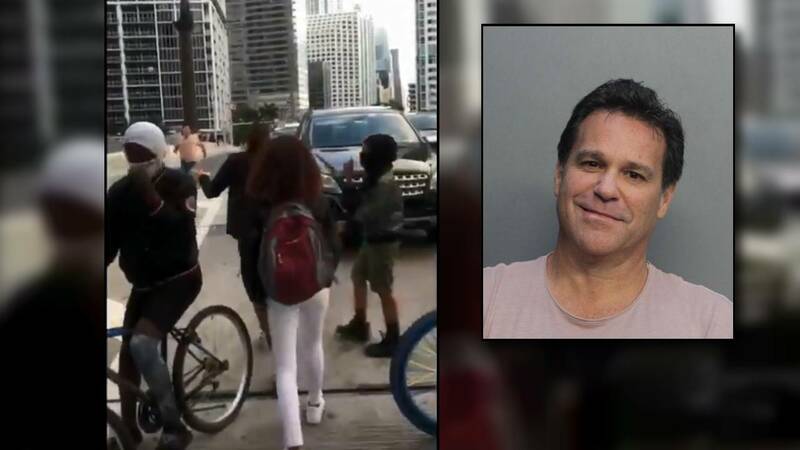 According to an arrest report obtained by the Miami Herald, Bartlett asked the arresting officer, “Why am I being arrested when those kids are free to ride around?” He admitted to pulling out his gun, but said that he never pointed it at the kids, according to the report. Bartlett was taken into custody and charged with carrying a concealed firearm. His bond was set at $5,000.